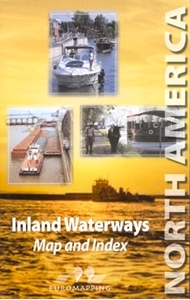 The North America Inland Waterways Map represents an overview of the choice of itineraries North America offers for recreational navigation. The map is attached to a 64 page booklet which gives an introduction to the waterway infrastructure, followed by background notes on most of the waterways listed. Heritage sites and vistor centres and other structures & sites of interest are also listed, and resources for further information are suggested. The main map covers central and eastern North America, with insets for the north-west, the Winnipeg region, Sacramento-San Joaquin Rivers region, Southern Texas, Nova Scotia, the Welland Canal region, Southern Florida and the canals of NYC, NJ, eastern Pennsylvania. The map shows Primary waterways, smaller operating waterways, historic canals and those which are disused or under restoration, railways built as part of original canal transport network, locks, floodgates, obstacles to navigation, museums, heritage sites, boat lifts, tunnels & aqueducts on heritage canals, major inland commercial marine terminals.